The Democratic Republic of Congo is in the throes of its worst-ever Ebola outbreak, with more than 420 cases in the country’s volatile east, and a mortality rate of just under 60 percent. But this outbreak — the nation’s tenth known Ebola epidemic — is unusual because more than 60 percent of patients are women. Among them is Baby Benedicte. Her short life has already been unimaginably difficult. At one month old, she is underweight, at 2.9 kilograms. And she is alone. Her mother had Ebola, and died giving birth to her. She’s spent the last three weeks of her life in a plastic isolation cube, cut off from most human contact. She developed a fever at eight days old and was transferred to this hospital in Beni, a town of some half-million people in the east of the Democratic Republic of Congo. 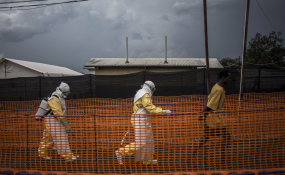 More than 400 people have been diagnosed with Ebola here since the beginning of August, and more than half of them have died in a nation the size of Western Europe that struggles with insecurity and a lack of the most basic infrastructure and services. That makes this the second-worst Ebola outbreak in history, after the hemorrhagic fever killed more than 11,000 people in West Africa between 2013 and 2016. This is 10th outbreak to strike the vast country since 1976, when Ebola was first identified in Congo. And this particular outbreak is further complicated by a simmering civil conflict that has plagued this region for more than two decades. Guido Cornale, UNICEF’s coordinator in the region, says the scope of this outbreak is clear. “It has become the worst outbreak in Congo, this is not a mystery,” he said. What is mysterious, however, is the demographics of this outbreak. This time, more than 60 percent of cases are women, says the government’s regional health coordinator, Ndjoloko Tambwe Bathe. "All the analyses show that this epidemic is feminized. Figures like this are alarming. It’s true that the female cases are more numerous than the male cases," he said. Bathe declined to predict when the outbreak might end, though international officials have said it may last another six months. Epidemiologists are still studying why this epidemic is so skewed toward women and children, Cornale said. “So now we can only guess. And one of the guesses is that woman are the caretakers of sick people at home. So if a family member got sick, who is taking care of him or her? Normally, a woman,” he said. Or a nurse. Many of those affected are health workers, who are on the front line of battling this epidemic. Nurse Guilaine Mulindwa Masika, spent 16 days in care after a patient transmitted the virus to her. She says it was the fight of her life. "The pain was enormous, the pain was constant," she said. "The headache, the diarrhea, the vomiting, and the weakness — it was very, very bad." For the afflicted, the road to recovery is long and lonely. Masika and her cured colleagues face weeks of leave from work to ensure the risk of infection is gone. In the main hospital in the city of Beni, families who have recovered live together in a large white tent, kept four meters from human contact by a bright orange plastic cordon. They yell hello at their caretakers, who must don protective gear if they want to get any closer. And for Baby Benedicte, who is tended to constantly by a nurse covered head to toe in protective gear, the future is uncertain. Medical workers aren’t entirely sure where her father is, or if he is going to come for her. She sleeps most of the day, the nurse says, untroubled by the goings-on around her. Meanwhile, the death toll rises.